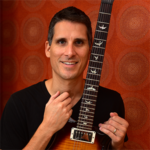 Hailed as a “music-theory expert” by Rolling Stone magazine, guitarist Desi Serna is a music instructor and author who has written several books on guitar including Fretboard Theory, Fretboard Theory Volume II, Guitar Theory For Dummies, Guitar Rhythm and Technique For Dummies, Guitar Picking Mechanics, and How To Teach Guitar and Start Your Own Music Instruction Business. He is known for his practical, hands-on approach to music teaching, with a focus on the guitar fretboard and emphasis on popular songs. Desi honed his craft through decades of teaching, performing, and publishing. He lives in the Nashville, Tennessee area. Sign up to receive Desi’s FREE 6-Step video course, “Bedrock Guitar Theory of the Pros,” to discover the 6 simple concepts that will have you rockin’ guitar music like a pro in half the time of ordinary lessons.